Woody Allen’s latest is a fancy production resurrecting Old Hollywood, but my emotions for the characters and their journeys left me flaccid. I suppose the most die-hard Woody Allen fan will want to check out Café Society anyway for its fleeting pleasures and paradoxes to his earlier work. Woody also has Vittorio Storaro as his cinematographer for the first-time, and there’s a nostalgic luster to many of the images in scenes set in oak-wood offices, gold-column movie palaces, rich peoples’ homes with long swimming pools, and a nightclub that’s almost as sumptuous as “Bullets Over Broadway” (Woody’s 1994 movie). 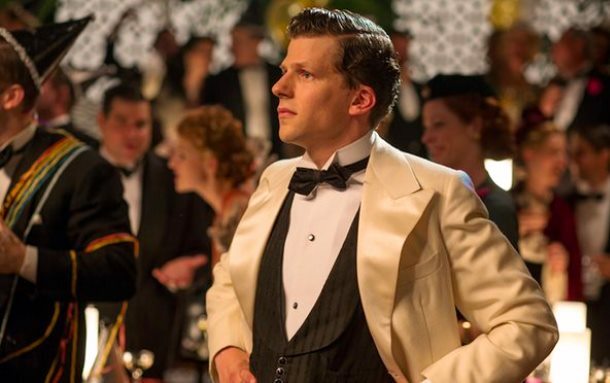 It’s Jesse Eisenberg’s job to channel Woody (in case you hadn’t suspected), to go from tenderfoot with no stake in the movie business to a dapper Eisenberg arc after he’s finally made it. Steve Carell, who plays Eisenberg’s uncle, is a honcho agent who name-drops every big celebrity of the period. The first scene has Carell talking about how he’s gonna represent Ginger Rogers, later he has an analytic discussion on Joel McCrea. You think Carell is going to be the big scene-stealer, a classic Woody character. But when you learn he’s a wimpy and whiny adulterer, the character goes limp and uninteresting. Turns out Eisenberg and Carell have feelings for the same girl, played by Kristen Stewart – whom the more you see outside of the “Twilight” franchise, the more one can see she has real talent, even depth. 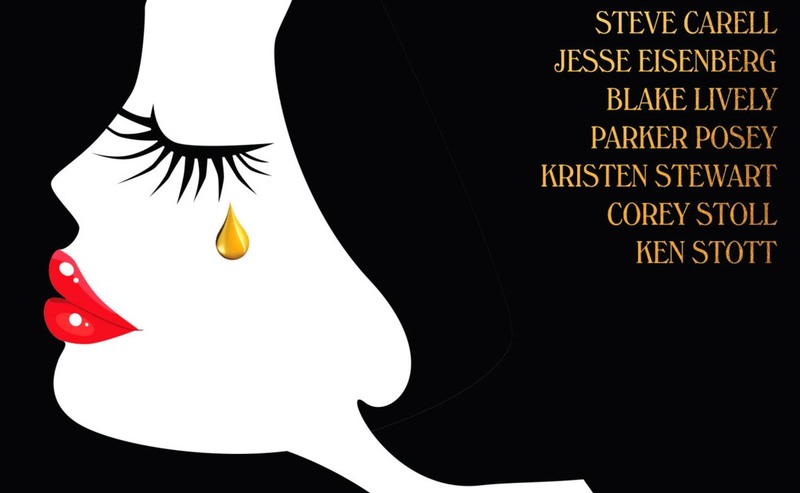 See “Adventureland,” “The Clouds of Sils Maria,” “Still Alice” for proof. But yes, I am signaling that it’s another inconvenient love triangle in a Woody movie. Perhaps you’re already sighing because you’ve had enough of Eisenberg later, lamenting that he hasn’t done anything great since “The Social Network.” Well, I can grimace all too easily after enduring his awful performances in “Batman v. Superman” and “Louder Than Bombs” (though it’d be hard for me to find one other person in the world, outside of a critic’s circle, that’s seen that one). But I implore all doubters to check out “The End of the Tour” where his ramblings and musings actually added up to one hell of a smart performance. But I can’t get behind Eisenberg this time, though, and he is what sinks the movie. I tried my best to forgive an early off-putting scene where he verbally fumbles with a newbie call girl (it feels like a “Deconstructing Harry” rerun, a 1997 Woody movie). Yet long after that, Eisenberg is still too nebbish and too much a twit to be a romantic lead who succeeds like he does – I wished failure upon him more than success. Another actor could have seduced Blake Lively, playing a classy 1930’s gal, who is the consolation after he first splits up with Stewart. Another actor in the part of street smart Bobby from New York, then maybe “Café Society” could have swept me up. Hell, I’d even suggest Oscar Isaac for the part, who could be great in any upcoming Woody movie! But even then, the skewering of old glamorous Hollywood, as well as its delectable corn aspects of that heyday, still falls so far short of the Coen Brothers’ “Hail, Caesar!” from earlier this year, that well… Woody lightweight fluff is sometimes a little too soft, at least compared to what the Coens did. Or even what the Oscar-winning “The Artist” did, which I might have once too presumptuously dismissed as fluff. “Café Society,” for all its beautiful camera set-ups, is less immersive than it is a jokey-bystander of the period. “Café Society,” it’s true, does sometime taps you on the shoulder with something sublime. Corey Stoll has some wry moments as a fancy-suit gangster, who is the older brother to Bobby. Oh, there’s the scene where Eisenberg and Stewart have a reunion years later, what a marvel in acting! See, even in a second-rate Woody Allen movie, there are still mild pleasures to be had. By the way, I should mention that I hadn’t seen Woody’s “Whatever Works” since it came out in 2009, which I didn’t like at the time. I saw it again, and I was captivated by it, I think it’s one of the stronger, more wickedly funny Woody movies of recent years. I can’t believe I didn’t see its merits at the time. But with “Café Society” I don’t think I’ll be having a change of heart with it years from now. It’s simply a lukewarm experience. Film Cousins: “Radio Days” (1987); “Whatever Works” (2009); “The End of the Tour” (2015); “Hail, Caesar!” (2016).